January 11, 2018 at 9:50 pm. SERIES HISTORY: 35th all-time meeting. Eagles lead series, 18-14-2. They last met in Week 10 of the 2016 season at Lincoln Financial Field. The Eagles won the game, 24-15. This will be the fourth postseason meeting between the two teams. The last time they met in the playoffs was in the 2004 NFC Championship Game. The Eagles won that game, 27-10. KEYS TO THE GAME: In an era that focuses on quarterbacks throwing, this game may be decided on the ground. Without dual-threat quarterback Carson Wentz, the Eagles must be able to run the ball against the Falcons. The one and only running back to rush for 100-plus yards against the Falcons defense this season was Jay Ajayi, and Ajayi wasn’t with the Eagles at the time. He was with the Miami Dolphins in Week 5 when he put up 130 yards on 26 carries in a 20-17 win. The Eagles acquired him at the trade deadline in late October for a conditional fourth-round draft pick. Ajayi said Wednesday his success against the Falcons earlier this season should be an advantage for him Saturday. “It’s good that we’re playing them because I’ve seen the defense before,” he said. “I’m familiar with it. I’ve been using the experience of having played them earlier this year, just remembering some of the things that worked. The Falcons have been determined to run the ball in each of their past two games, to the point that they used tackle Ty Sambrailo as a third blocking tight end. Sambrailo played seven of 73 offensive snaps (9.6 percent) against the Rams and 10 of 72 (13.9 percent) against the Panthers. On the other side, the Eagles allowed only seven rushing touchdowns and held 10 teams to under 100 yards rushing. The first-team defense did not allow a 100-yard rusher all season, apparently discounting Dallas running back Ezekiel Elliott’s 103 yards. OK, for the record, the Falcons do have quarterback Matt Ryan, the NFL MVP last season, who passed for 4,095 yards, 20 touchdowns and 12 interceptions this year. And he has a great wide receiver in Julio Jones (88 catches, 1,444 yards). In place of Wentz, the Eagles have journeyman Nick Foles who has been inconsistent (57 of 101 for 537 yards, five touchdowns, two interceptions and a passer rating of 79.5). –Eagles DT Fletcher Cox vs. Falcons C Alex Mack and LG Ben Garland. Cox and Mack are two of the best players in the league at their respective positions. Mack did not give up a quarterback pressure in the loss to the Eagles last year. –Eagles RT Lane Johnson vs. Falcons OLB Vic Beasley Jr. Beasley, who had 15.5 sacks last season, has five this year. Johnson, who was a first-team All-Pro selection, has done an outstanding job against some of the league’s top edge rushers this year. –Eagles CBs Ronald Darby, Jalen Mills and Patrick Robinson vs. Falcons WR Julio Jones. Jones had 1,444 receiving yards, but just three touchdown catches this season. The focus of the Eagles’ corners will be keeping him in front of them and limiting his yards after the catch. PLAYER SPOTLIGHT: RB Jay Ajayi. Ajayi is the only running back to rush for 100 yards against the Falcons this season. He had 130 yards on 26 carries in Week 5 when he still was with the Miami Dolphins. FAST FACTS: Eagles — In his only playoff appearance (NFC WC vs. Saints in 2014), Eagles QB Nick Foles was 23 of 33 with 2 TDs … RB LeGarrette Blount has 8 TDs rushing in 8 career postseason games. Since entering NFL in 2010 he is tied for 3rd in league with 59 TDS rushing (including playoffs) … WR Alshon Jeffery had 136 rec. yards in only career game vs. Atl (10/12/14 with Chi.) … Zach Ertz is tied for 2nd among NFL TEs with 8 TDs and ranked 3rd with 824 yards receiving … DE Brandon Graham led Eagles with career-high 9.5 sacks … DT Fletcher Cox is one of 6 NFL DTs with at least 10 sacks (12) along with at least 2 FF (2) … CB Patrick Robinson led team with 4 INTs, 18 PD. Falcons — QB Matt Ryan has 41,796 career pass yards and surpassed previous NFL historical leader Peyton Manning (41,626) for most yards passing in his first 10 seasons. In his past 4 games vs. Phi. 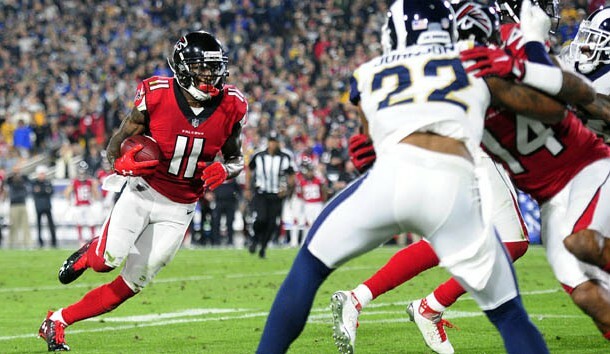 Ryan threw 10 TDs vs. 5 INTs for 100.3 rating … RB Devonta Freeman is aiming for 5th playoff game in row with TD … WR Julio Jones’ 1,444 yards receiving led NFC and he caught 9 for 94 yards and TD last week … LB Deion Jones led team with 10 tackles last week and his career-high 134 tackles was 2nd in NFC … Keanu Neal led NFC safeties with 113 tackles and made 9 tackles, FF in last game vs. Eagles … DE Takkarist McKinley was the only NFL rookie with at least five sacks (2), 2 FFs (2) … LB Vic Beasley Jr. made sack last week and two in last game vs Eagles. PREDICTION: Broadcasters may talk more about the absence of Wentz than the presence of Foles, whose key completions should be handoffs to Ajayi and that might not be enough. Regardless of what is said aloud, Ryan and the Falcons are still intent on overcoming most embarrassing implosion in SB history.